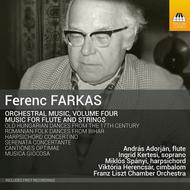 By Andras Adorjan; Ingrid Kertesi; Miklos Spanyi; Viktoria Herencsar; Franz Liszt Chamber Orchestra; Janos Rolla. By Ferenc Farkas (1905-). Classical. Listening CD. Published by Toccata Classics (NX.TOCC0230). 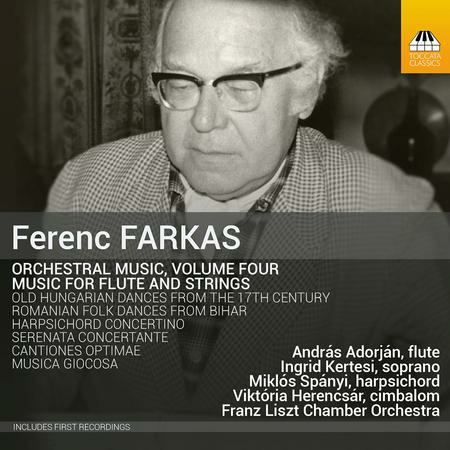 This fourth release in a series of recordings of orchestral music by the Hungarian composer Ferenc Farkas (1905-2000) concentrates on his music for flute and strings, highlighting the characteristics that make his music so appealing: catchy tunes, transparent scoring, buoyant rhythms and a fondness for Baroque forms and folk-dances. Two other concertante pieces - featuring soprano and harpsichord - offer contrast.